This Unique Table Skirt Wraps Around the Sides of Tables for an Elegant Display! Add Linens with Pleating or Other Covers to Effectively Decorate for Upcoming Formal Events! 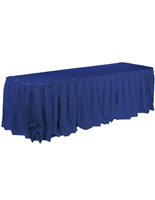 A Number of Affordable Table Skirt Options are Offered in the E-Warehouse! Polyester cloth is vibrantly colored yet long-lasting. Table skirts sold accommodate both rectangular & round tables. This table skirt looks fantastic when used during a business meeting, buffet, or other social event. 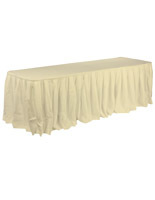 The linen features a box pleated style that creates a beautiful drape and wraps around either round or rectangular tables. 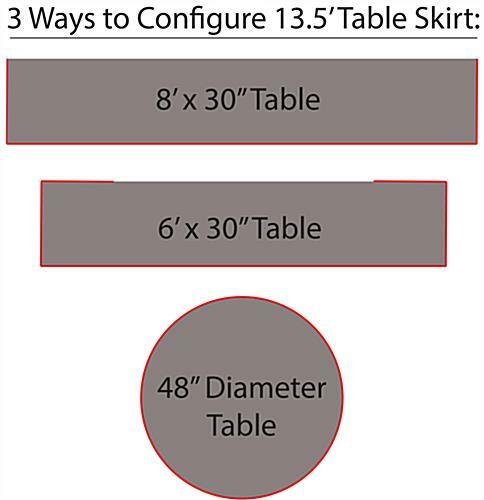 A table skirt, also called skirting, measures 13-1/2 feet long, and therefore easily fits a 48" dia. surface. This cover is also capable of dressing three sides of either a 6 or an 8-foot table. We recommend implementing a table skirt when setting up a serving-style dining setting. 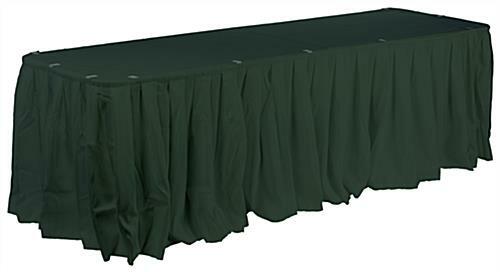 Not only will its box pleat, Hunter Green fabric look great beneath a selection of food, but also the open backside gives employees the ability to stow additional supplies or utensils. 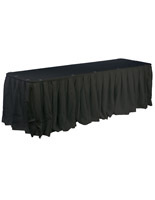 A table skirt is equipped with hook and loop siding that easily attaches to table clips. Although we do not provide the skirting with clips, they can be purchased separately. Simply select the appropriate number for a specific table's dimensions. 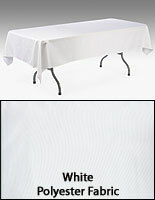 The table cover, table skirt is also sold without tablecloths for the top portion of the display. Due to the versatile nature of this item, users will not be limited by the shape or size of tablecloths, so a variety of presentation options are possible.